To celebrate Randal Churchill's new releases, we are currently offering a savings for his books. Bonus: If you request, the author will autograph your copy to you! Announcing the new release of the updated and expanded 2nd Edition of Randal Churchill's award-winning Regression Hypnotherapy, which experts have called the most important book about regression ever written. Randal Churchill's Catharsis in Regression Hypnotherapy has been published to rave reviews. "This book is unique and revolutionary.... Randal Churchill has been one of the most insightful and innovative practitioners in the field of hypnotherapy for over a quarter century. His integration of approaches to beneficially influence the subconscious mind is so clearly and compassionately demonstrated that this fascinating book is an important addition to the fields of dream therapy, hypnotism, Gestalt therapy and psychology." In Become the Dream, the author introduces a powerful combination of therapies that brings Gestalt dreamwork together with hypnosis. The vast majority of dreamwork methods rely on analysis and interpretation. By contrast, Gestalt dreamwork brings the dreamer into a deeper experience of the dream itself and allows the individual to find the unique relationship of the dream to his or her own existential experience. The addition of a wealth of hypnotic techniques takes the dreamer much further, with a variety of effective options such as hypnotic deepening, ideomotor methods, regression and positive suggestions for further insight and integration. Actual transcripts and commentary from a wide range of fascinating dreamwork sessions, which draw the reader into an intimate look at therapy from the inside. With great sensitivity and skill, the author demonstrates the remarkable potential of this unique therapy to tap into the receptivity and wisdom inherent in the subconscious mind and the potential for profound change. Become The Dream is a powerful and practical teaching tool for professionals in any of the health and counseling fields, and an inspiring and provocative book for anyone seeking self-knowledge and actualization. For a further introduction and description of this book, see the introduction by Ormond McGill. "I consider Randal Churchill one of the best hypnotherapists working today, and a superb teacher of this powerful transformative art. He has poured his heart, his soul, and over 40 years of hands-on experience into this book, which is filled with information on the best methods and techniques for working with dreams, hypnosis, regression and the subconscious mind.The detailed client stories, where actual dreams are explored in depth, make the book entertaining as well as enlightening. "Become the Dream is essential reading for counselors and therapists, as well as a great resource for ordinary readers interested in the healing nature of dreams and the potential of hypnosis as a therapeutic and personal growth tool." "Become the Dream is a very welcome addition to the literature of Gestalt Therapy. Gestalt dream work, when practiced skillfully, is more art form than therapy, and I'm happy to see that Randal Churchill understands truly the art of working with dreams." "Randal Churchill's caring style and humor provide an added dimension to this inspiring and pioneering work. Become the Dream illuminates the personal and existential relationship of the dream to dreamer. Unlike interpretive dreamwork, the dream is re-experienced on a heart and soul level, where the subconscious mind reveals real dramas being played out in life. Connecting with the dreamer's own innate wisdom, Randal skillfully combines an eclectic array of techniques with gifted intuition to lead the dreamer to profound insights and personal transformation. It is truly a pleasure to read this innovative and non-analytical approach to dreamwork." "Become the Dream promises an awareness that goes beyond the bounds of our five senses. Combining hypnosis and dreamwork as Churchill has done confirms the ancient Aboriginal understanding that dreaming is an intangible world that is an intimate and indispensable aspect of the tangible one. Avoiding the typical conscious interpretations of dreams, Churchill shows how transformation is more likely when dreams are experienced via the hidden power of hypnosis." "Randal Churchill provides a crucial service for dream-workers, hypnotherapists, and other professionals by writing an up close and personal account of processing dreams, using a gentle yet potent combination of hypnotherapy and Gestalt dreamwork. In Become the Dream, he presents his 25 years of pioneering work in a manner that makes the elusive and magical transformative process both believably real and reassuringly approachable. I highly recommend this book for anyone who offers process work professionally or for those interested in exploring their dreams." "In Become the Dream Randal Churchill provides innovative approaches to combining hypnosis and dreamwork in support of therapeutic goals, which simultaneously encourages integration of conscious and unconscious processes in service of honoring the whole person. The generous inclusion of verbatim case history transcripts vividly underscores the significance of the client/therapist relationship in any counseling situation. The dialogues are particularly interesting and valuable in illustrating how much the client (and the client's unconscious resources) contributes to the therapeutic process." Dreams contain more than unresolved issues; they are the method by which the subconscious and super conscious mind speak to us. By learning to interact with the elements of our dreams, we can reclaim forgotten strengths and talents expressed in the dream, resolve issues and find the necessary power to conquer addictions. Randal Churchill, a clinical hypnotherapist withover 28 years experience presents a new spin on two classic therapeutic techniques which he calls Hypnotic DreamworkTM. By combining Gestalt therapy (which uses non-analytic dreamwork) and Clinical Hypnotherapy (to access the power of the subconscious), Mr. Churchill has created an effective technology for personal transformation that emphasizes the participant's personal power and recreates the role of the practitioner as Guide rather than as therapist (which is similar to many shamanic traditions). Using mostly case histories, Mr. Churchill presents evidence in support of Hypnotic DreamworkTM, while introducing the reader to his compassionate and highly intuitive methodology. His book provides a basic overview of both Gestalt therapy and Clinical Hypnotherapy, and would be suitable for the layperson seeking a viable technology for personal treansformation using their dreams as guideposts as well as therapists in search of deepening their use of dreamwork with clients. Having spent months in training with Randal Churchill as my own Hypnotherapy teacher I am pleased as well as honored to review his new book, Become the Dream. Besides being precise, clear and well written this book is actually easy reading for a topic which could become esoteric and rambling. Randal brilliantly presents his material, his expertise and his style of work. He offers explanation and understanding to the reader. Randal is most absolutely a master of understanding the human psyche and spirit, and is one of the most creative and capable in the work he does helping his clients and students to help themselves through hypnotic dreamwork techniques. "Dreams hold the answers without having to intellectually figure them out...The most important meaning is the truth of one's experience... Avoiding interpretation keeps us focused on direct access to the wisdom of the greatest ally and potential therapist of all, our own subconscious minds..."
Become the Dream is excellent reading for those interested in dreams and a must for all who work with others in the helping professions. Tending to a dream experientially involves bringing the dreamworld back to life as much as possible. To this purpose, it helps to relax the rational waking mind. A shift in consciousness is a key element in re-entering the dream. Randal Churchill's recently published work, Become the Dream: The Transforming Power of Hypnotic Dreamwork, is a strong testimony to the power of the hypnotic state in reviving dream images. Churchill is a talented hypnotherapist who has written extensively on the subject of hypnosis. His current book includes a number of detailed transcripts of actual dreamwork sessions under hypnosis that suggest profound transformative and healing effects on the dreamers as a result of engaging in dialogue with a dream-other. Churchill's emphasis on the ethics of facilitating such contact between dreamers and dream-beings makes his book useful reading for dreamwork practitioners.... I was moved by and appreciative of the outcomes of his dreamwork sessions. 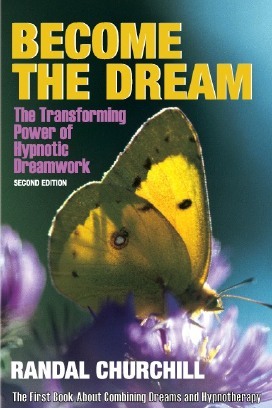 Become the Dream: The Transforming Power of Hypnotic Dreamwork is an innovative approach to exploring dreams by Randal Churchill. Founder of the Hypnotherapy Training Institute, Churchill is the originator of Hypnotic DreamworkTM, a powerful combination of Gestalt dreamwork and hypnosis. Drawing on transcripts from a wide range of fascinating sessions, the reader is given an intimate look at therapy from the inside, as Churchill demonstrates the potential of this unique work to tap into the receptivity and wisdon inherent in the subconscious mind and the potential for profound transformation.